Developer finally has to follow (at least some of) the same rules as everyone else. 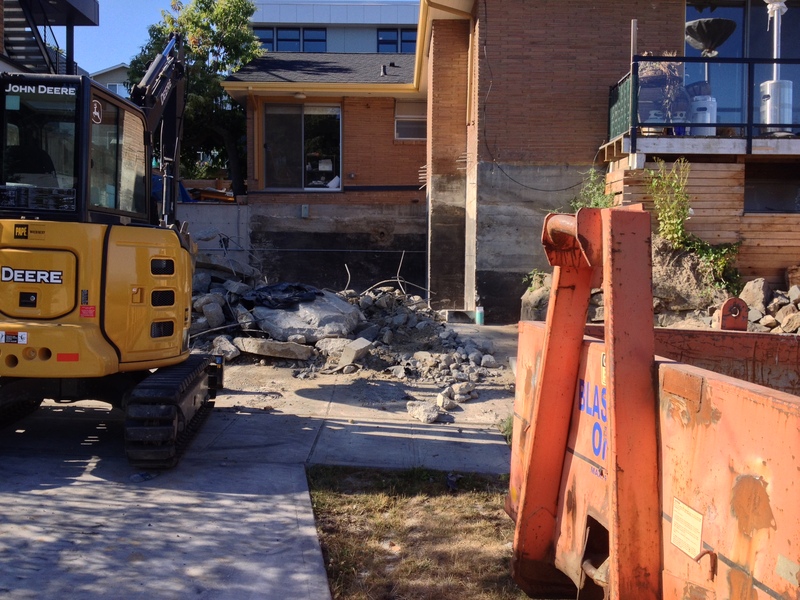 The developer is currently destroying the new garage he built onto the original house at 3650 55th Ave SW. As described in this earlier post, the developer built a garage that blatantly ignored his city permit, which required the garage to be totally underground. The developer is building a new garage, which needs to be about 3 feet lower than the illegal garage. Dismantling the illegal garage and replacing it with a garage that follows the rules is estimated to cost tens of thousands of dollars. All this would have been avoided if the developer followed his own building permit. The developer group that failed to follow the simple rule of building the garage underground is the same developer group that orchestrated the complex web of loopholes which allowed them to build 3 houses in a space where everyone else in the neighborhood is limited to 2 houses. Also, if the developer had not used loopholes to shrink the lot on the corner to make room for the third house, then his above ground garage would not have exceeded the lot coverage rules. This entry was posted in Uncategorized on July 19, 2014 by kindneighbor.